For an unforgettable experience, rent out our entire facility! 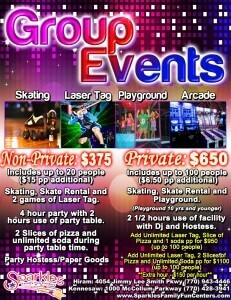 You can’t beat our prices for private events, starting at just $650 for up to 100 people. For the cost of your private event rental, you will get to use our expansive facility for 2.5 hours, and we will supply you with a DJ and a party host to help run your party. An indoor playground for kids ages 1-10 years old, including a special toddler area for kids 2 and younger! With a variety of activities to choose from and flexible upgrade options, we can tailor your private party to perfectly fit your needs, giving you and your guests a day or night of fun like no other! Ready to make a reservation?